This forex system is a High Frenquency Scalping System based on the two filters Bullseye Forecaster and Genesis Matrix indicator. -Arrow blue of the HFT Indicator. 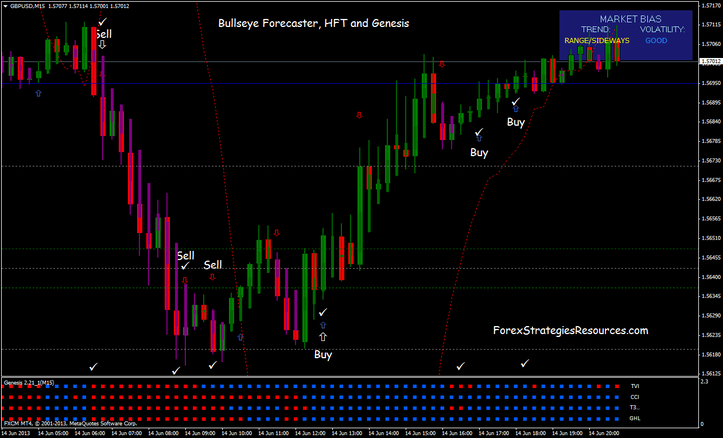 - The price should be above the Bullseye Forecaster for a long trade. - The Genesis matrix indicator indicator should show 3 or 4 (not 1 or 2) blue boxes . - Enter on the close of the set up bar. -Arrow red oh the HFT Indicator. - The Genesis matrix indicator should show 3 or 4 (not 1 or 2) red boxes . On the pivot points levels. Place stop loss should be set about 3 pips above the recent swing high on a sell trade and about 3 pips below the recent swing on a buy trade. This Scalping System is also good for trade on the binary options (High/low) and (One Touch) binary options strategies. Read more.. In the pictures below Bullseye Forecaster, HFT and Genesis Matrix in action. 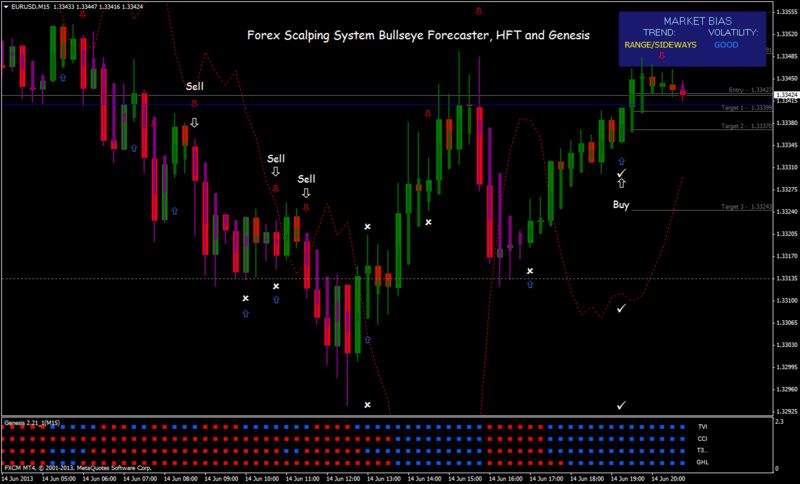 Trading System:Bullseye Forecaster, HFT and Genesis Matrix indicator is a scalping system based on the two filters Bullseye Forecaster and Genesis Matrix indicator.